A charming beachfront setting. The ResortQuest Maui Kaanapali Villas is set in 11-acres of lushly landscaped exotic tropical gardens on one of Kaanapali's finest stretches of beach. 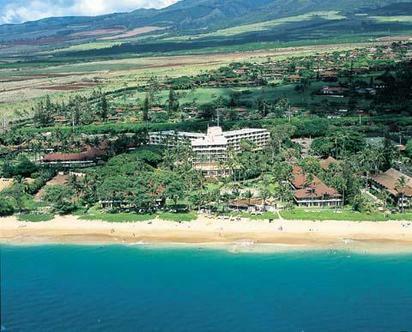 The resort is ideal for active travelers who want to be surrounded by all the fun activities that Maui has to offer. Guest rooms - studios - and suites are located in low-rise and mid-rise six story buildings. Studios and suites offer fully equipped kitchens. Guest rooms have mini-refrigerators. Daily maid service is - of course - provided.Fun activities are at the heart of this resort whether guests want to enjoy one of our three swimming pools - stroll the beautiful beach - whale watch in the winter - or take advantage of our onsite watersports activity center. Castaways Cafe offers island flavored cuisine and everyones favorite beverages. When guests want to explore the Kaanapali Resort area complimentary trolley shuttle service is available. The ResortQuest Maui Kaanapali Villas provides guests with the Hawaii they've been dreaming of. ***A daily facility fee of $10.00usd applies to all reservations. Fee includes- Parking, telephone, access to fitness center, in-room wireless internet and a discount at Hauoli Spa. *** HAWAII*S NON-SMOKING LAW ***In the interest of the good health of all our guests,employees and owners, and in compliance with the State Law Act 295, ALL ResortQuest Hawaii hotels and condominiumunits managed by ResortQuest Hawaii are now designated as Non-Smoking Accommodations effective immediately. *** Beachfront Pool Enhancement *** In an on-going effort to provide exceptional services and amenities to our guests, the ResortQuest Maui Kaanapali Villas is planning on the following enhancements to two of their three pools from September 19, 2007 to December 19, 2007: ew 3,600 sq foot pool and children pool area.